Can you tell I am a fan of Nutella? Seriously, when I buy a jar I have to defend it with my life. My kiddos are all over that jar, but mommy wants her chocolately, nutty spread that reminds her of Ferrero Rochers candy. Just let me be alone with the Nutella jar! Anyway, I guess it’s a good thing the kids are around, because I might be just a wee bit heavier if they weren’t. My kids help lower my calorie intake because this mom has a hard time saying no when it comes to sharing her food. Any other mom struggle with this? Last year I discovered cake mix cookies. That was one of the Top 50 Best Days of My Life. Pitiful, I know, but hey — my days are always brighter when I find short-cuts. Now, if my kiddos want some home-made cookies, I just stir a box of cake mix together and roll out some cookie dough, bake and the kids are chowing down on some semi-homemade cookies. Really. It’s that easy. Now these cake mix cookies are a little bit trickier. It took me a little while to get the stuffed thing going on. I almost thought my pics would end up being one of those “Nailed it” photos of stuffed cookies. But, after several failed attempts, I finally got my cookies cooperating with me. I’m actually glad I messed up the first batch because then I knew what mistakes to tell my readers to avoid. I don’t want you trying my recipe and then saying “Nailed it” on Pinterest. I really want you to like my recipes and succeed at this cooking and baking thing! So, before you get rolling out the dough, here are some tips for making stuffed cookies. Refrigerate your dough. No matter what recipe you are using, and no matter what that person says, refrigerate your dough before assembling a stuffed cookie. You need a firm cookie dough to get these cookies to cooperate during the stuffing process. Take your time. Don’t do this when you’re in a rush. 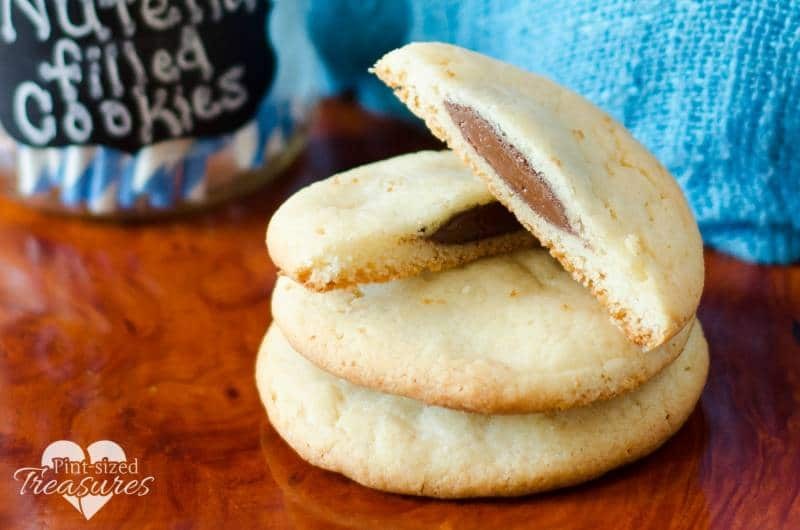 Make cake mix cookies, yes, but not stuffed ones. It takes a little bit more patience and time. Keep your hands dry. Silly me! I was washing my hands off after a few cookies and heading right back to the dough, only to have those cookies slip around and not obey my orders. So, take it from me — work with dry hands. Flatten cookies. Some recipes say roll into balls and then form. It didn’t work for me. I rolled into balls and then flattened. After the cookie was flat, I was able to successfully assemble a stuffed cookie. Don’t overbake. These cookies will look underbaked when they are perfectly baked. Don’t go past the ten minute mark! OK, now you’re ready to conquer this recipe! You won’t be sorry you did! This is my hubby’s fave cookie recipe so far, and he is a difficult, taste-testing judge. So get ready to bake some irresistibly, delicious cookies! 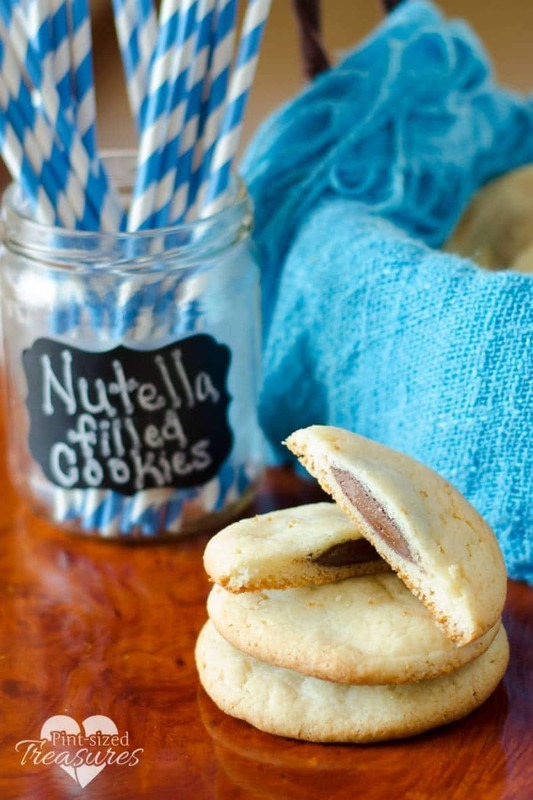 Mix all ingredients together, except the Nutella. Once thoroughly combined, chill the dough for 30 minutes in refridgerator. Chill the Nutella for 30 minutes as well. Once the nutella and cookie dough are both chilled, preheat oven to 400 degrees Farhenheit. Next, roll cookie dough into 1 teaspoon-sized balls and then flatten. Carefully drop about 1/2 heaping teaspoon of Nutella on top of flattened cookie. 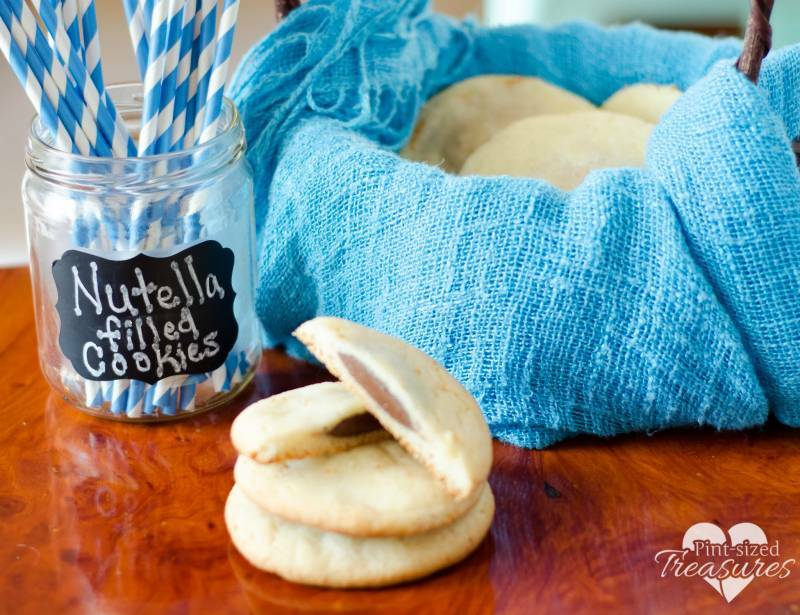 Then, place another rolled and flattened cookie on top of the Nutella and seal all edges. The cookie wil be tall, but will flatten when baking. Repeat for each cookie. Bake on parchment-lined cookie sheet for 8 minutes. Remove and let cool for 15 minutes. Enjoy! Yields: 16 stuffed cookies.